Welcome to Gokceovacik, a charming traditional village in the Taurus Mountains just above the Mediterranean coast and the town of Gocek. With its stunning scenery and secluded location - yet within easy reach of beaches, water sports, spa, mud baths, horse riding, markets, small seaside towns, mountain walking, boat trips, great restaurants and historic sites - this is an idyllic setting for a relaxing holiday or romantic retreat. The Old Farm House is located on the edge of the forest in an elevated position with stunning views across the valley. Built in 1950 the Old Farm House is full of character, with stone walls, wooden floors and ceilings, white plaster walls and large fireplaces. But with added modern features providing comfortable accommodation with a new kitchen and bathroom, two bedrooms, one a double and the other has two single beds located in the converted barn with an en-suite. Designed for outdoor living, the terrace is a great place to enjoy a meal or sit back and watch the sun set over the distant mountains, chill out throughout the day on the patio or relax in the hammock and of course to keep you cool in the garden is a fresh water plunge pool no chemicals are used and the water is changed every 3 days. You can enjoy a range of organic produce from the village farmers including bread, milk, yoghurt, eggs, figs, grapes, butter, olives, olive oil delivered each morning. Gokceovacik and the surrounding areas, give you an exciting blend of classical sights, sounds and fragrances guaranteed to give your senses a taste of Turkey. 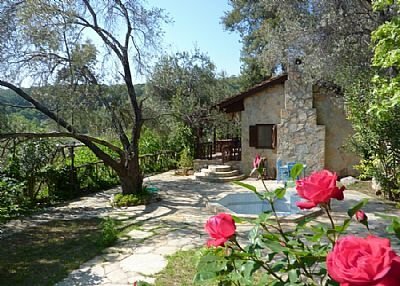 This is a great base if you want to explore this beautiful part of Turkey or if you are looking to escape and just relax then you have found your ideal spot. Welcome to the start of your holiday. Gocek the St Tropez of Turkey as many have described it attracts the rich and famous from across the world, their yachts adorn the harbour and this has created a quite unique environment. Gocek has maintained its qualities as a charming and rustic traditional fishing village. However, you will find that Gocek has all the facilities you would expect from a larger resort. Gocek is a place of two halves, on the one hand its a traditional Turkish village with friendly people selling local crafts, rugs and fake designer goods like any large Turkish village but the other face of Gocek is a place with boutique hotels, designer shops, laid back bars and stylish waterfront restaurants, where you will find a fantastic choice of fresh fish, meat and organic vegetables. The Sunday market is an essential visit and dont for get to haggle! From the marina you can hire a private boat for the day or go on one of the many boat excursions around the 12 Islands. A fantastic day out for all the family. Gocek gives you the best of both worlds, this is not your typical tourist town, Gocek is very clean, relaxed and friendly with spectacular mountain and sea views - the ideal spot for a relaxing holiday or a holiday adventure. INLICE BEACH: is approximately 800 metres in length with a deep stretch of dark coloured sand. The sea is safe for bathing in calm conditions and during windy periods the sea can be quite wavy. Along the beach you will find a cafe there is a car park, shower and WC facilities, changing cubicles and lounging chairs and umbrellas for hire. Inlice offers a refreshing coolness and in the evenings there is the heady scent of thyme and pine forest. GOCEK BEACH: 20 minutes by water taxi. Enjoy a swim in crystal blue waters or rest under the pine trees and enjoy the peace and quiet. There is a simple restaurant and restroom facility available on the island. SARIGERME BEACH: with miles of golden sand, shallow sea and the island of Babada not too far in the distance, is a great day out for all the family. A short walk along the wooded footpath with its turkeys, chickens and peacocks running free, brings you out onto the exceptionally clean beach. Facilities include food and drink outlets, water sports, showers, toilets, beach chairs, umbrellas and dressing cabins are all available. IZTUZU BEACH: one of the most beautiful beaches on the Mediterranean coastline. This sand bar that separates the sea from the mouth of the Dalyan Creek is an excellent swimming beach. Iztuzu Beach has also been preserved, as it is one of the last nesting grounds for the endangered Loggerhead Turtles. WHITE-WATER RAFTING: in Dalaman is one of the most exciting holiday experiences and is perfect for active thrill seekers. The Dalaman River is rated as one of the top rafting destinations in the world. Professionals will guide you every step of the way for an unforgettable adventure on the Dalaman waters. DALYAN: a small but exquisite fishing town, which lies next to a meandering river, teaming with wild life. After spending your time browsing the typically diverse Turkish market stalls, why not relax and take a look at the Lycian tombs, carved into the rock face, from the comfort of one of the many romantically set restaurants lining the Dalyan riverside. It only takes you a few minutes from the centre of town to stroll through to the Old Dalyan of gardens and willow trees, to flavour days gone by. SULTANIYE HOT SPRINGS & MUD BATHS: Situated just before Dalyan Creek joins the lake, you can give yourself a body pack of mud and then wash it all off again in a sulphur pool with temperatures as hot as in the Sultaniye Baths. KAYA KOY: Once a thriving Greek village, this town of over one thousand houses, two churches, fourteen chapels, and two schools, was completely deserted in 1923 when the 25,000 Greek inhabitants were repatriated to Greece. Since then, the village of Kayakoy which had been continually inhabited since 13th century, has stood empty and crumbling, with only the breeze from the mountains and mist from the sea blowing through its empty houses and streets. A wonderful place steeped in history that touches you to the very soul. KAUNOS: amongst the ruins of the city, you will find an old theatre, a large rectangular building that was probably a temple, others of uncertain description, a Byzantine church, and very curious rock-hewn tombs. SAKLIKENT GORGE the ideal place to visit if you are feeling especially hot. The gorge is 18km long and so steep and narrow that the sun does not penetrate, so the water is icy cold. The gorge is approached along a wooden boardwalk above the river and opens out to a series of wooden platforms suspended above the water, where you can buy and eat trout at one of the specialist restaurants. PATARA BEACH with miles of golden sand features regularly in brochures as one of the Mediterraneans most beautiful beaches and was recently voted the 2nd best beach in Europe by The Telegraph. Entrance to the beach is through the ruins of the ancient city of Patara, with a triumphal gate, baths, a theatre and a few temples. XANTHOS a UNESCO World Heritage Site and one of the six principal cities of Lycia. Xanthos was the capital city of the Lycian Federation and its greatest city for most of Lycian history. LETOON was the sacred cult centre of Lycia its most important sanctuary and was dedicated to the three national deities of Lycia - Leto and her twin children Apollo and Artemis. TLOS best-known for its fortress-topped acropolis, with its rock-cut tomb-covered sides and its 360 degree panoramic views. As one of the six principal cities of Lycia and one of the most powerful.